Appendix 1. The verification of methods and technologies for the numerical simulation of gaseous mixture transmission through long pipelines. Boychenko A.L., Kiselev V.V., Komissarov A.S., Pryalov S.N., Seleznev V.E. Appendix 2. The construction of a mathematical model for liquid transmission through a system of open channels. Pryalov S.N., Seleznev V.E., Zelenskaya O.I. Appendix 3. A model of surging effects in the “GCU centrifugal supercharger — adjacent connecting gas pipelines” system. Kiselev V.V., Seleznev V.E. Appendix 4. Practical examples of the application of a computational fluid dynamics simulator of a gas transmission enterprise. Boychenko A.L., Kiselev V.V., Komissarov A.S., Motlokhov V.V., Pryalov S.N., Seleznev V.E. Appendix 5. On the architecture of the computational fluid dynamics simulator of a gas transmission enterprise. Motlokhov V.V., Seleznev V.E. Appendix 6. A brief analysis of the method implemented in the “RSTRENG” software. Aleshin V.V. Appendix 7. Variant of the implementation of the finite element method for an analysis of the stress state of industrial pipeline systems. Aleshin V.V. Appendix 8. On the application of ANSYS and ABAQUS software for the structural analysis of industrial pipelines. Aleshin V.V., Kobyakov V.V., Seleznev V.E. Appendix 9. Program for automated creation and analysis of pipeline segments in beam approximation. Aleshin V.V., Kobyakov V.V. Appendix 10. Program for automated creation of geometrical solid model of the pipeline with surrounding soil. Aleshin V.V., Dikarev K.I. Appendix 11. Program for automated creation of geometrical solid model of the pipeline segment with corroded defect. Aleshin V.V., Kobyakov V.V. Appendix 12. Program for automated search for burst pressure for the pipeline segments with outside corroded wall defects. Aleshin V.V., Kobyakov V.V. Appendix 13. Estimating the effect produced by input data errors on the accuracy of the pipeline structural analysis. Aleshin V.V., Dikarev K.I., Kobyakov V.V. Appendix 14. Program for automated analysis of stress state of cold bent pipeline segments. Aleshin V.V., Dikarev K.I., Kobyakov V.V. Appendix 15. Program for automated creation of shell finite-element models of excavated pipeline segments. Aleshin V.V., Dikarev K.I., Kobyakov V.V. Appendix 16. Program procedures to analyze stress state of underwater pipeline accounting effect of flow surrounding this pipepine. Aleshin V.V., Dikarev K.I., Seleznev V.E. Appendix 17. An example of computer program in APDL for radiation matrix generation. Aleshin V.V., Fotin S.V. Appendix 18. An example of computer-aided fire hazard analysis for a gas pipeline segment in the vicinity of a gas regulating station of a power plant. Aleshin V.V., Fotin S.V. Appendix 19. An example of numerical nonlinear structural analysis for a defective gas pipeline segment under a transient thermal effect of fire. Aleshin V.V., Fotin S.V. Appendix 20. The application of dynamic programming methods to the optimization of gas transmission modes through a gas pipeline network. Kiselev V.V., Seleznev V.E. Appendix 21. On estimation of the speed of sound in a real gas. Pryalov S.N., Seleznev V.E. In recent decades the most critical problems the global community has faced have been technological disasters and the consequences of a lack of energy sources. The situation is aggravated by the criminal activities of international terrorist organizations. These circumstances require an efficient solution to the problem of improving energy safety in the industrially developed nations. They require us to reassess the importance of solving problems related to the increasing of safety levels, and more efficient, enviromentally-friendly enterprises in the energy sector [1–9]. Among the main components of such enterprises are high pressure gas pipeline systems. Nowadays the world’s pipeline transportation systems and power plant pipelines are becoming notably less reliable; as a result, the environment is subject to increasingly harmful impacts. In particular, it should be noted that industrial objects characterized by technological (deliberate or accidental) emissions of gas mixtures into the atmosphere are often located near populated areas, or even within their boundaries following established town-planning practice. The accident at the Urengoy–Petrovsk GP of the Bashtransgaz Ltd., which took place on April 9, 2003, and caused the ignition of transported natural gas, can be presented as a notorious example: three houses burnt down in a neighbouring village as a result of the accident . Unfortunately, over 550 accidents occurred at transmission pipelines throughout the world between 1992 and 2001, according to articles [8, 10–14, 281]. The average annual accident rate is 50–60, and this figure shows no sign of decreasing. Russia’s natural gas transmission pipelines experienced more than 18 accidents over the period from May 2003 to June 2004, with a methane-air mixture being ignited during 15 of them [282, 289]. Foreign companies operating pipeline systems also suffer from similar problems. Two major accidents happened in the USA over a short period (from June 1999 to August 2000): at a gasoline pipeline of Olympic Pipe Line Co., and at a natural gas pipeline of El Paso Natural Gas Co . Those accidents caused serious public concern about the state of American pipelines. Both of them were accompanied by heavy fires, in which 14 people died, let alone huge losses of transported product and the costs of pipeline restoration. One of the principal reasons for accidents at industrial pipelines is their age. The bulk of oil and gas pipelines have been in operation for more than 25 years [6, 7]. Apart from emergency situations, small emissions of harmful gases into the atmosphere may be produced as a result of planned procedures. In this case they are made in accordance with gas pipeline regulations. The following are some examples of these types of emissions: planned, specially organized emissions of natural gas at gas distributing stations; gaseous emissions from power plants (steam, carbon dioxide, nitrogen, NOx, SO2+SO3, COx, SH4, S2H4, S20H12 (benzapyrene), V2O5, carbon soot, etc. ), etc. [14–17]. Emissions of the so-called greenhouse gases into the atmosphere, and their generation during the violent fires, are dangerous contributions to global climate change. In the light of the latest international treaties on global climate change, the problem of cutting emissions of carbon dioxide and methane in the energy sector is of particular importance [3–5]. Natural gas accounts for more than 60% of global emissions of harmful gases into the atmosphere. In addition to consequences for the environment, accidents in pipeline networks of energy sector enterprises cause notable economic damage [18, 19]. Thus, according to the data presented by the Associated Limited company (Canada), material damage caused by a small plume emission of natural gas into the atmosphere can be up to 175000 US dollars, while emission on a larger scale can cost as much as 50 million dollars . All of the above facts demonstrate that the problem of increasing fire and environmental safety of pipeline networks of energy systems is urgent indeed. Solving the problem of safety improvement should go hand in hand with solving the problem of cutting the costs of product transportation by pipelines. The importance of such a solution may be illustrated by the following example: Even at the stage of delivering natural gas from the field to the consumer, more than twenty percent of the gas being transported may be burnt at gas-turbine units of compressor stations [20–22]. Therefore, large amounts of natural gas become internal costs to the relevant gas-transport company and do not reach the market. In view of the modern level of industrial development, solving the problems of increasing safety and efficiency of pipeline transport requires the application of numerical simulation methods. These methods allow a detailed integrated analysis of complicated technological systems to be made with a high level of reliability and accuracy. The application of simplified methods of pipeline structural analysis, as ways of determining possibly damaged zones during accidents at pipeline transportation facilities, or using simplified computational simulators of pipeline networks for their operational optimization give rough estimates of actual parameters of physical processes. These estimates do not meet the requirements of pipeline system design and operation or lead to inaccurate results. This can be illustrated with several practical examples. In-line magnetic flux leakage (MFL) pigs are used for the technical inspection of transmission pipelines. Calculated estimates of magnetic field parameters, as well as values for the forces that act on the pig structure and are caused by these fields, are required for a scientifically based development and advancement of the means and techniques of in-line technical inspection. Up until the mid-1990-s such estimates were generally made by means of analytical and semi-empirical dependencies . The application of analytical and semi-empirical dependencies, for the analysis of changes in electromagnetic field parameters and values of forces, is only acceptable for defects of the simplest shapes (in terms of strict geometrical classification) and significantly simplified analytical models of pig structures. With actual defects and forces in place, the difference between analytical models and results of on-site measurements can reach tens to hundreds of per cent [24, 25]. Similar observations can be applied to traditional techniques of analytical models for the stress state analysis of pipeline structures, those tecniques being based on methods of the strength of materials and structural mechanics (e.g. see [26–29]). They do not allow for adequate structural analysis of complex pipelines to be made with the required accuracy, and in some cases may give a wrong assesment of the structure’s stress state [30–33]. One of the most common accidents at gas pipelines is their rupture. Some researchers suggest applying isothermic models of gas flow through pipeline systems (or their modifications) in order to promptly locate the accident and take measures to contain it [34–36]. These models, having been applied to real accidents in Russia and West European countries, turned out to be inconsistent, as the calculated values of gas flow through damaged systems were inaccurate [37, 38]. OND-86 and OND-90 techniques are used for evaluation of concentrations of harmful chemical species in gaseous emissions produced by factories [39, 165, 166. These techniques are based on semi-empirical dependencies and impose a number of important limitations on the elevation of the contamination source, and the wind speed, taking into account the local relief, buildings and other structures. They make it possible to calculate the distribution of contaminant concentrations in the surface air, i.e. at the altitude of 2.0 meters above the ground. As a rule, the proponents of such methods proceed from experimentally observable laws of concentration distribution over long periods of time, and set the parameters such that experimentally observable concentration values should not exceed the calculated values under any climatic conditions with 90% probability, which means that the method cannot be used for the calculation of the current state of concentration field. According to one study , comparison of SO2 concentrations obtained experimentally from a chimney of the Karabashmed company to those calculated with the OND-86 method showed a divergence of results of 40 div 80 times. A similar comparison of experimentally obtained and calculated values of SO2 concentrations emitted from chimneys of power plant N21, belonging to the Mosenergo company, gave a divergence of results of 1.2 div 2.4 times . These examples confirm that transition from simplified analytical methods to high-accuracy mathematical modelling based on numerical methods of continuum mechanics, mathematical optimization and a broad application of modern computer technology is necessary . Input data for this modelling may come in the automated mode from up-to-date diagnostic equipment, automated information-control systems, geographical information systems, meteorological services, etc. The present publication presents a generalized and comprehensive study of the theoretical basis, algorithms, computer-based implementation and industrial application of technologies aimed at improving safety and operational efficiency of industrial pipeline systems. The technologies in question have been developed and improved by scientists and specialists of the Computational Mechanics Technology Center of SPE VNIIEF-VOLGOGAZ Ltd. (Russia) since the early 1990s [21, 42–46, 167]. Ever since the launch of these developments, their scientific consultation has been provided by Dr.Sc. R.I.Il’kaev, Academician of the Russian Academy of Sciences. 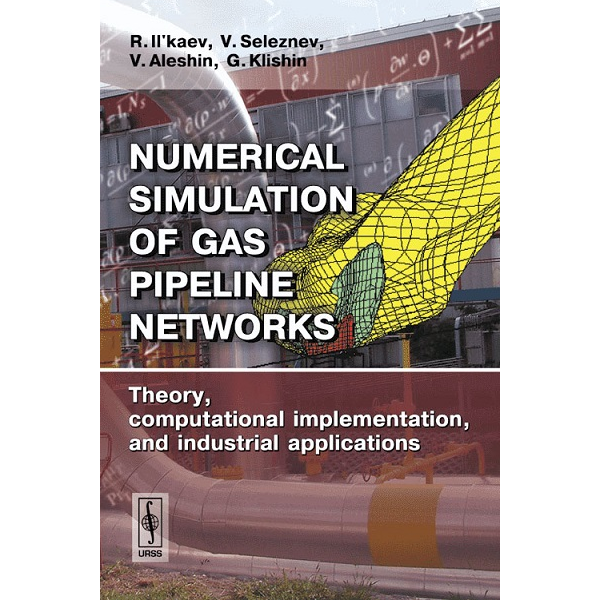 These developments are based on a mathematical approach to the numerical simulation of complicated pipeline systems using well-known basic models of continuum mechanics, numerical methods of mechanics and hybrid methods of mathematical optimization proposed in previous studies [42, 47, 58, 63]. These techniques are currently being successfully applied to numerous industrial problems related to making industrial pipeline transportation networks in gas, oil, chemical and energy industries more efficient, safe and environment-friendly (e.g. see [32, 33, 38, 48, 167, 168]). They are also used for the development and efficiency analysis of anti-terrorist measures, creating software and hardware complexes for the early detection of dangerous deviations of transportation parameters during the operation of pipeline systems (e.g. see [44–46, 49–53] and details of the International Science and Technology Center Projects: N1482, N1806 and N2409 ). Chapter 1 of the monograph deals with the description of the numerical simulation of pipeline systems for improving their safety and efficiency. The chapter presents the principles of construction or selection of the corresponding mathematical models and methods of their numerical analysis, and gives an example of validation techniques being developed (during on-site trials). Chapter 2 considers the technology of numerical simulation of the operation of magnetic instruments for technical inspection of pipeline networks. Chapter 3 presents methods and technologies for the development and application of high-accuracy computational fluid dynamics simulators for numerical analysis of gas transportation modes through long branched pipeline systems during their normal operation and in emergency situations. Chapter 4 is concerned with methods and technology for numerical structural analysis of industrial pipeline systems. Chapter 5 describes the technology of numerical simulation of damage factors acting during the failure of high pressure pipelines. Chapter 6 considers the theoretical footing and background of the industrial application of high-accuracy computational fluid dynamics simulators for cutting costs associated with the transportation of gases and fluids through extensive pipeline networks. Chapter 7 presents the conception of intelligent information-control systems for gas transmission enterprises using high-accuracy fluid dynamics simulators. Chapter 8 describes approaches to pipeline defective segment ranking using the PipEst computation technology. Chapters 1, 2, 7 and 8 are written by R.I.Il’kaev, V.E.Seleznev, V.V.Aleshin, and G.S.Klishin. Chapters 3, 5 and 6 are written by V.E.Seleznev, Chapter 4 by V.V.Aleshin. The main body of the monograph is supplemented and illustrated with materials presented in twenty-one appendices. Materials presented in Appendices 1 and 4 are prepared by V.E.Seleznev jointly with S.N.Pryalov, A.L.Boychenko, A.S.Komissarov and V.V.Kiselev. Appendix 2 is written by V.E.Seleznev, S.N.Pryalov and O.I.Zelenskaya, Appendices 3 and 20 by V.E.Seleznev and V.V.Kiselev, Appendix 5 by V.E.Seleznev and V.V.Motlokhov, Appendices 6 and 7 by V.V.Aleshin, Appendix 8 by V.V.Aleshin, V.V.Kobyakov and V.E.Seleznev, Appendices 9, 11 and 12 by V.V.Aleshin and V.V.Kobyakov, Appendix 10 by V.V.Aleshin and K.I.Dikarev, Appendices 13, 14 and 15 by V.V.Aleshin, V.V.Kobyakov and K.I.Dikarev, Appendix 16 by V.V.Aleshin, K.I.Dikarev and V.E.Seleznev, Appendices 17, 18 and 19 by V.V.Aleshin and S.V.Fotin, Appendix 21 is prepared by S.N.Pryalov. The authors wish to express their gratitude and appreciation to the staff of the Computation Mechanics Technology Center of SPE VNIIEF-VOLGOGAZ Ltd. Irina Skiteva, Olesya Korshunova and Oksana Ustyushina for their work on the translation of the manuscript into english and their assistance in preparing the manuscript for publication. The authors are sincerely thankful to the collective of the URSS Publishers for their considerate and friendly attitude towards them and for the high quality editing of the translation, professional preparation and printing of the monograph. Preparation of the monograph’s manuscript was financially supported by the International Science and Technology Center within the framework of the ISTC Project N2759 and in collaboration with Los Alamos National Laboratory (USA). Some of the developments described in the monograph were carried out with financial support of the International Science and Technology Center within the framework of the ISTC Projects N1452, 1806 and 2409, and in collaboration with the Fraunhoffer Institute for Non-Destructive Testing (Germany), Sandia National Laboratories (USA) and the Environmental Protection Agency (USA). The computational equipment used at the stage of writing the manuscript was offered to the authors within the framework of the Russian-American Intergovernmental Agreement of September 22, 1998 under the Nuclear Cities Initiative Program (NCI Project N04446000-99-35). The costs related to the publication of the monograph were paid by the Computation Mechanics Technology Center of SPE VNIIEF-VOLGOGAZ Ltd.
Director of the Russian Federal Nuclear Centre–All-Russian Scientific Research Institute of Experimental Physics (RFNC–VNIIEF). Doctor of Science, Academician of the Russian Academy of Sciences, Academician of the Russian Academy of Rocket and Artillery Sciences, Laureate of three State Prizes. Honoured worker of science. Awarded with the Order of Merit for Fatherland of the third degree. Principal field of specialization: high energy density physics. Professional interests: physical science and technology of dual application. Author and co-author of more than 350 scientific works. Deputy Chief Designer of the RFNC–VNIIEF, Head of the Computation mechanics technology centre of SPE VNIIEF-VOLGOGAZ Ltd. (CMTC). Doctor of Science. Principal field of specialization: mathematical simulation of industrial facilities of energy systems and complexes. Professional interests: computation mechanics, mathematical optimization, conversion of defense science and technology. Author and co-author of more than 170 scientific works dedicated to improving safety, efficiency and the environmental friendliness of complex technological systems by means of computation mechanics and mathematical optimization. Deputy Chief of department of the RFNC–VNIIEF, Deputy Head of the CMTC. Doctor of Science. Principal field of specialization: mathematical simulation of industrial facilities of energy systems and complexes. Professional interests: computation mechanics, conversion of defense science and technology. Author and co-author of more than 120 scientific works dedicated to improving industrial and fire safety of complex technological systems by means of computational mechanics. Chief Designer of the RFNC–VNIIEF, Director of SPE VNIIEF-VOLGOGAZ Ltd. Principal field of specialization: instrumentation and automation of industrial facilities of energy systems and complexes. Professional interests: theory of creation and operation of intelligent information-control hardware and software systems, conversion of defense science and technology. Author and co-author of more than 120 scientific works dedicated to creation and practical application of intelligent information-control hardware and software systems and computation technologies for integrated assessment of state of the fuel and energy complex industrial facilities.